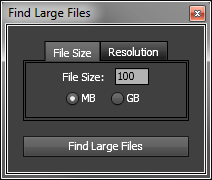 Find large files in your project by file size or resolution. This script finds large files/items in your project, by either file size or resolution, and moves them to a new folder. For file size, enter a number and specify whether it's in terms of MB or GB; for resolution, you need to specify width & height. Originally requested by Ronald Molina. Project Sync 3 gives you the ability to share After Effects Project files between multiple users. The all new Sync 3 has been completely rewritten and offers new features and a stable platform to keep you and your team moving through the toughest deadline. smartRescue lets you repair working files that won't open anymore. It offers several so called steps that run over your working files to update them so that you should hopefully soon be back working in your files. And you can easily add your own steps to smartRescue and share them with your team. Save Comp As Project exports any of your compositions as a new projects. It automatically reduces exported projects and collects files! View, troubleshoot, organize, and export project data. Local Hero saves the day by migrating network assets to your local workstation for improved efficiency. Quickly create a null at key layer points & parent layer to null. Trim or extend comp duration to fit layer contents. Convert expressions to keyframes faster, simpler and with more control than ever before. Set all / specified project item label colours per item type. Good for organizing imported projects. Take control of your shape layers! Explode & merge for greater precision.